December 2008--We got our I-171 and now all we need is a referral. February 2009--We get the call! We have a referral for a tiny baby boy who we decide to name Haven. Even though we thought Haven was going to be a girl. Our very first picture of Haven. He is severely malnourished and suffering from malaria. 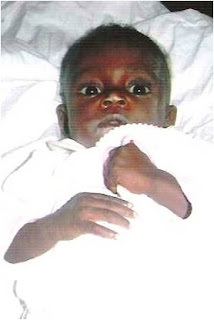 Sometime in 2009--We hope to bring home Baby Haven, soon soon soon!! !